In this tutorial, you’ll learn how to create a turn-based strategy game for the iPhone. I’ve always liked this type of game, the Advance Wars series for Nintendo DS being one of my favorites. Simplified versions of turn-based strategy games, such as Hero Academy, have lately become popular. How to load a map with different types of terrains. How to create different types of units with unique properties. How to make them move and attack using a couple of AI pathfinding methods. 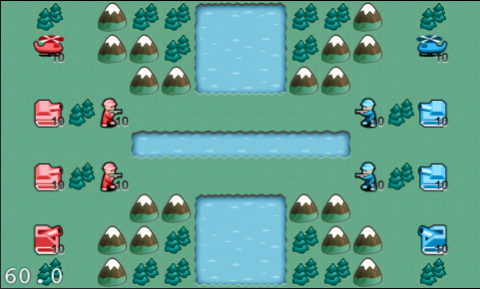 By the end of the tutorial you will have a basic, playable version of an Advance Wars-like game that can be played with a friend on the same device. To make the most of this tutorial, you’ll need some Cocos2D experience and a beginning understanding of AI. You will also use Tiled for your maps, so a good understanding of this program and of tile maps in general is required. In this first part of the two-part series, you’ll set everything up to enable you to load units for both teams and move them around. Are you ready? Commence mission! As you can see in the image, each player controls their own units. Player 1 controls the red units and Player 2 the blue ones. As the tutorial progresses, you’ll create four types of units, each with different properties, such as their range of movement and damage capabilities. Each player will also have an HQ they must protect. You’ll create the HQ buildings in such a way that it will be easy to extend the game to create other types of buildings, like factories, airports, etc. 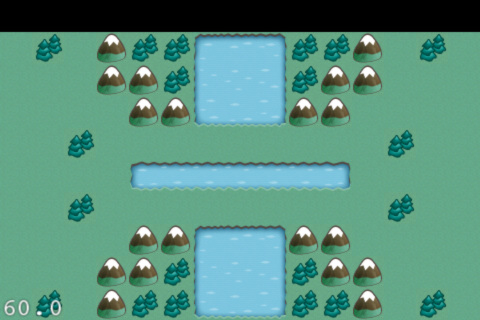 Finally, in the above image you can also see different types of terrain: grass, mountains, water and forest. Each terrain type allows only certain types of movement from the units. For example, soldiers can walk over water (with reduced movement), but tanks cannot. Helicopters can fly anywhere. While it’s not visible in the image, the final version of the game will have a bar at the top of the screen indicating whose turn it is, as well as an End Turn button to pass the turn to the other player. These will be added in the second part of the tutorial. To get started, download the tutorial starter project and extract it to your preferred location. This will be the starting point containing the basic Cocos2D project and most of the assets, including the free game art pack by Vicki and the tilemap used to create the map you see above. I made this project by creating a new project from the Cocos2D basic template, which provides you with a working project that has a HelloWorldLayer with a label in the middle of the screen. Of course, we’ll not be using the HelloWorldLayer but will be creating our own game UI but this gives us a basic starter Cocos2D project that we can be certain works correctly. In fact, it might be a good idea for you to open the project in Xcode at this point and compile it and run it to make sure that everything is working. Do note though that we’ve removed the actual “Hello World” text from the HelloWorldLayer and so, you’d only get a black screen (after the initial Cocos2D splash) if the project runs correctly. But if the projects does compile properly, then you’re set! You’ll find that the tilemap is already done. Since this isn’t a Tiled tutorial, I won’t go over the details of how to create it, but I will mention things that are important for the project to work. For a very complete tutorial on how to create tilemaps using Tiled, I recommend this tutorial created by Ray. 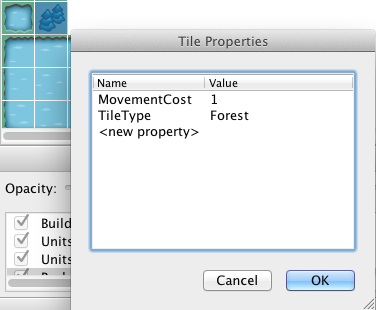 Inspect the tiles (by right-clicking them in the tileset window and selecting “Tile Properties…”) and you will see two properties called MovementCost and TileType. I created these properties so that we can identify specific attributes for each tile (such as the type of tile) in our code later. 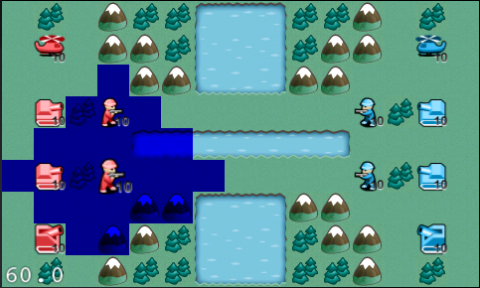 The StageMap.tmx file contains just five layers: the background layer, which contains these terrain tiles; two Units layers, for placing each player’s units; and two Buildings layers, for placing each player’s buildings. 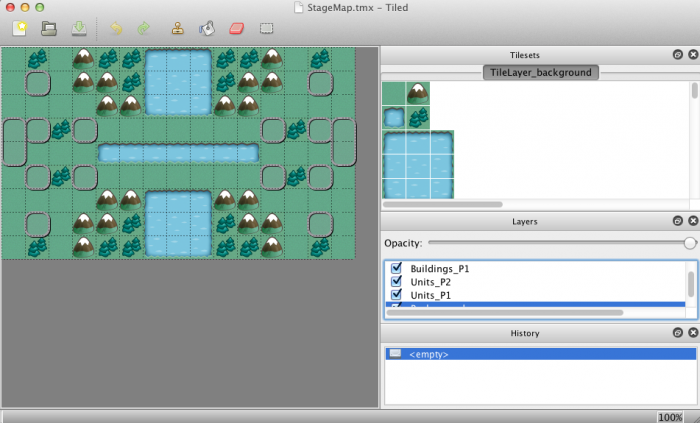 Now that you have an understanding of how the tilemap is structured, switch over to the Xcode project for TurnWars. You need to load the StageMap.tmx tilemap inside your HelloWorldLayer, which will be the main layer of the game. In the above code, we’ve defined several instance variables to point to the tile map, several of its layers, and an array to hold data about individual tiles on the background tile layer. Movement Cost: how much it costs a unit to move through a tile. Position: the tile’s position, which you’ll use later to determine a unit’s movement options. Add TileData.h and TileData.m files to your project by creating a new file with the iOS\Cocoa Touch\Objective-C class template. Name the class TileData, and make it a subclass of CCNode. The above code is fairly straightforward since the TileData class, as the name implies, is mostly a data receptacle. You initialize it with various values for the class properties and have a couple of methods which calculate various scores based on the properties for the current tile and its parent. If you’re wondering what the g, h, and f scores are, check out our Introduction to A* Pathfinding tutorial. You first load the tilemap included in the project. 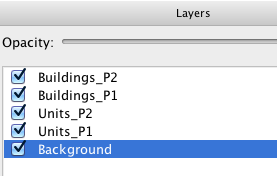 Then, you retrieve the layer named "Background", which contains the terrain tiles for the map. Next, you create an NSMutableArray to contain the information of every tile in the map. That array is populated with TileData objects created with properties gathered from each tile in the tile layer, the same properties you looked at in Tiled earlier. Go ahead and run the project now. You should see the tiles you saw before in Tiled appear on the screen. Your game will have four different types of units: Soldier, Tank, Cannon, and Helicopter. Each unit type will have its own movement range, and a set of strengths and weaknesses when combatting other units. Some types will be restricted from moving through certain terrains. As you saw earlier in Tiled, the map contains two layers for player units, one for each player's units. Each player has six units, represented by gray object tiles. 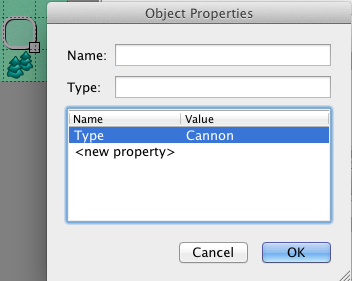 If you check a unit's properties (right-click and select "Object Properties...") you'll be able to see that they all have a "Type" property. This will help you determine which units to load, what kind of units they are and where to position them. Next, we create the Unit class that will hold most of the information for your different units. Later, you'll create other classes for each unit type that will inherit from the Unit class and define unique properties specific to each type of unit. Add Unit.h and Unit.m files to your project by creating a new file with the iOS\Cocoa Touch\Objective-C class template. Name the class Unit, and make it a subclass of CCNode. The above simply defines the Unit class as a sub-class of CCNode. It contains properties which identify basic attributes of the unit and also has a few additional instance variables which allow the unit to refer back to the main game layer, HelloWorldLayer, or detect whether the unit is moving or whether the unit has a weapon. But before you can add the code for the Unit class implementation, we need a few helper methods in place which are useful in handling sprite dimensions for retina display and allow you to set the position of units. We will add these helper methods to the HelloWorldLayer class since we need access to some layer properties, such as the size of the layer, that we would not have from within the Unit class. // Can the unit walk over the given tile? // Was this unit below the point that was touched? The Unit class is pretty basic right now. init initializes the class with its max hit points (the same for every unit) and sets the initial state for the unit. Then you have createSprite which will handle the information received from parsing the tilemap. createSprite receives the unit's position, dimensions, unit type, etc., and creates a sprite to display the unit based on its type. Also, the code adds a label on top of the sprite to display the unit's remaining HP. The rest of the code mostly deals with detecting touches on the units and is fairly self-explanatory. You'll use this later to be able to select each unit for moving. Now that you have a Unit class which will act as the base for all player units, you should create four different classes that will inherit from Unit. These four classes will shape your four different unit types. In this tutorial, the code for the four classes is pretty similar, but as you keep working on your game, you may need to add special cases for each unit/scenario. Let's begin with the Soldier unit. Add Unit_Soldier.h and Unit_Soldier.m files to your project by creating a new file with the iOS\Cocoa Touch\Objective-C class template. Name the class Unit_Soldier, and make it a subclass of Unit. This class is pretty simple. Its movementRange (the number of tiles it can move per turn) and the attackRange (the distance it has to be from an enemy unit to be able to attack it) are set when the unit is initialized. You also have a method, canWalkOverTile, which you'll use to determine if the unit can pass through certain terrains. For example, the Tank unit can't move over a water tile and in the Tank class, we'd need to check whether the specified tile is a water tile. In the case of the Solider, it can walk over all terrain and so simply returns YES without any further checks. In order for your project to work, you must have code in place for all four unit classes. For the time being, create implementations for the other classes by simply copying the code for the Soldier class. Name the new classes Unit_Tank, Unit_Cannon and Unit_Helicopter. Do note that if you copy and pate the code from above, you would need to change all instances of Unit_Soldier in the code to the appropriate value. The above code retrieves the correct unit layer (either player 1 or player 2 in the tilemap), and for each object found, gets its information and instantiates a Unit object according to the object type. The only complicated bit of code is section #3 where we get the unit type from the object and based on the type, create an instance of the correct Unit sub-class (Unit_Soldier, Unit_Tank, Unit_Cannon, or Unit_Helicopter). Since all of those classes contain the nodeWithTheGame:tileDict:owner: method, the call to that method creates an object from the correct Unit sub-class. That's it! Now you should be able to compile the project. Go ahead and give it a try! When you load the game you should now see each player's units on screen as they are laid out in the tilemap. Mark the tiles that the unit can move to. Enable the user to tap one of the marked tiles to move the unit there. Finally, move the unit while avoiding impassable tiles. Note: In order to accomplish the above, you'll need to use pathfinding algorithms, especially for the last step. This tutorial will not go over the details of how these algorithms work, but you can find a great explanation in this tutorial and in this one. // If you already dealt with it, you ignore it. // If there is an enemy on the tile and you are moving, ignore it. You can't move there. // If you are moving and this unit can't walk over that tile type, ignore it. // If you can move over there, paint it. // Check how much it costs to move to or attack that tile. Basically, when a touch is detected on a unit, we deselec the currently selected unit (via the HelloWorldLayer which always keeps track of the currently selected unit) and then ask that the touched unit be marked as the new selected unit. This in turn initiates the code to mark the squares available to this unit to move to via the markPossibleAction: method. Now build and run the project. You should be able to touch any unit and see the surrounding tiles get painted in blue, marking the possible locations that unit can move to. Of course, when you play around for a little while, you'll notice certain movement anomalies - like the fact that tanks can move over mountains and water, or the fact that all units move the same number of squares. If you recall, we currently have the same code (that for Soldier units) for all the units. Hence, all units show the same movement behaviour. If you want to implement unique movement capabilities for different unit types, play with the movementRange variable inside each Unit subclass we created. For example, you could set the Helicopter's movement range to 7, to make it capable of moving greater distances in one turn. Now, if you build and run the game again, you should see that when you select tank or cannon units, the water and mountain tiles don't show up as available for moving to. Now that you're able to select units, the next step is to actually move them. Since you've already determined where the unit is able to move in the previous step, you could just have the unit move in a straight line to the selected destination. In this case, the logic would be quite easy, but it would look odd in gameplay since your unit might move over a mountain or water to get to the destination even though it is not able to move over that type of terrain. For example, you might see tanks rolling over water. To solve this problem, you have to figure out a way to move your units tile by tile, finding the shortest, most logical path. Here you'll use the code presented in this pathfinding tutorial as is, with very few changes. // Because you can't move diagonally and because terrain is just walkable or unwalkable the cost is always the same. // If the currentStep is the desired tile coordinate, you are done! This is similar to what you did before to figure out the tiles the unit can move to, but implemented in a slightly different way. 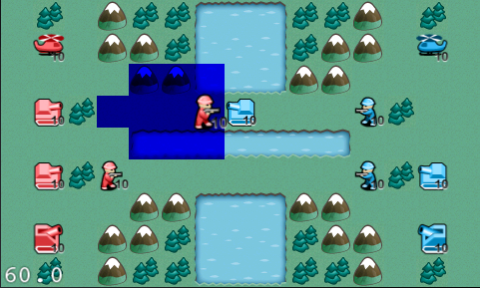 The code checks for the potential tiles the unit can pass through, and if they are on the shortest path and aren't occupied by enemy units, they are added to the final path. 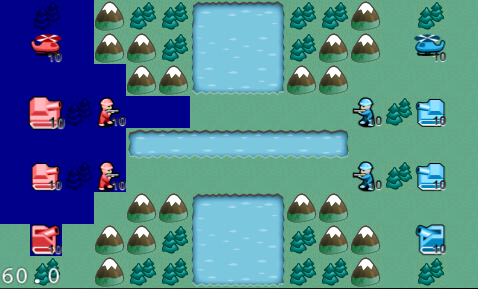 Once that path has been constructed, the unit sprite is moved through the tiles in the path. // You'll also handle attacks here, later. Build and run the game now. You should be able to select a unit, see where it can move according to the marked tiles, and then touch one of the marked tiles and have the unit move to that place. Do this as many times as you want and see what happens when you're near different tile types or enemy units. That's it for Part 1 of this tutorial! Now that you have the units in place and can move them around the battlefield, you're ready for Part 2, where you'll learn how to make the units attack… and more! An example project with all of the code from this part of the tutorial can be downloaded here. Any questions or feedback so far? Let me know in the forums.